Carmel Point Charmer... Near the Beach! Charming Carmel Point home, one and a half blocks from Rio Beach and a short walk to Carmel's main beach. This house welcomes you with beautiful gardens as you walk up the front path. You pause awhile on the veranda before stepping into the fully furnished house. A Monterey colonial with recently refinished hardwood floors and spanish tile pavers in the kitchen, rough cut beams in the living and dining rooms, and a pleasing ambiance throughout. The country kitchen invites you to linger over breakfast. The bedrooms are good size. The master bedroom has a skylight and is surrounded by trees, and from the bathroom has a view over the wetlands and up the Carmel Valley. This is a family vacation home loaded with books and games, yet organized for formal dining and entertaining. 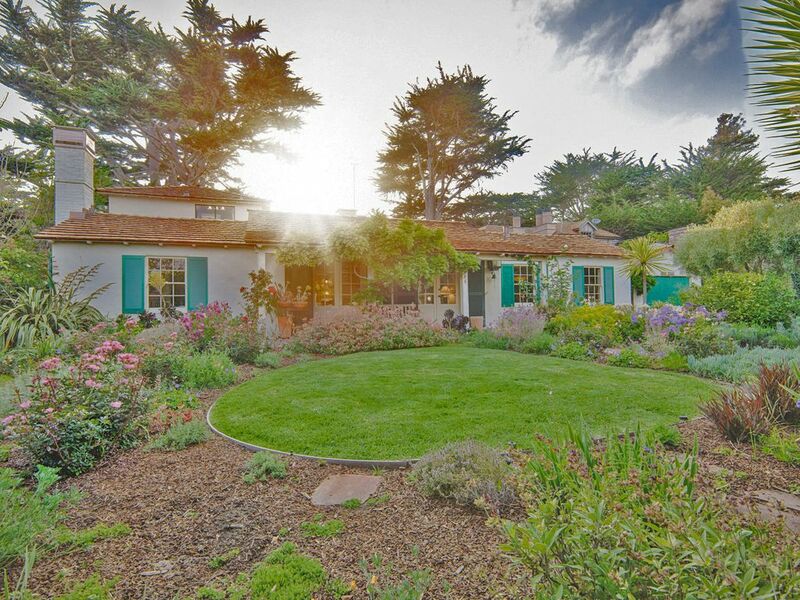 There is a brick patio with a BBQ and large enclosed back yard, towering Monterey Cypress trees, and lovely gardens. You can relax with a book in the garden, or in front of the open fire, walk to the beach, or enjoy the numerous activities in the Carmel/Monterey area. There are beach chairs, umbrellas blankets and toys and a wagon to get the gear to the beach. Monterey Peninsula has great golf courses including Pebble Beach, spectacular views, wonderful restaurants, Point Lobos, Big Sur, kayaking, lovely beaches, wineries, Monterey Bay Aquarium, museums, hiking, and water activities. There is off-street parking for several cars. All the bed linen is sent to the laundry for cleaning. The living room has a sectional couch and various chairs, a TV, music system, lots of books, both for recreational reading and information about the area. There is a variety of dishes, french bowls, serving pieces and utensils. Good knives for cutting. There is full range of small appliances, kitchen aid mixer, cuisinart food processor, blender, toaster and coffee grinder. The dining table seats 8 to 10. There is a full range of crystal glasses, table cloths and 'better ' dishes and utensils. There are a total of three flat screen TV'S in the house. Some toys and dozens of children's books. High Speed Internet Access, High Chair, Furnished, Lots of Summer Reads, Beautiful Gardens. This house works really well for multi generational families.